I write this still in a little state of shock. 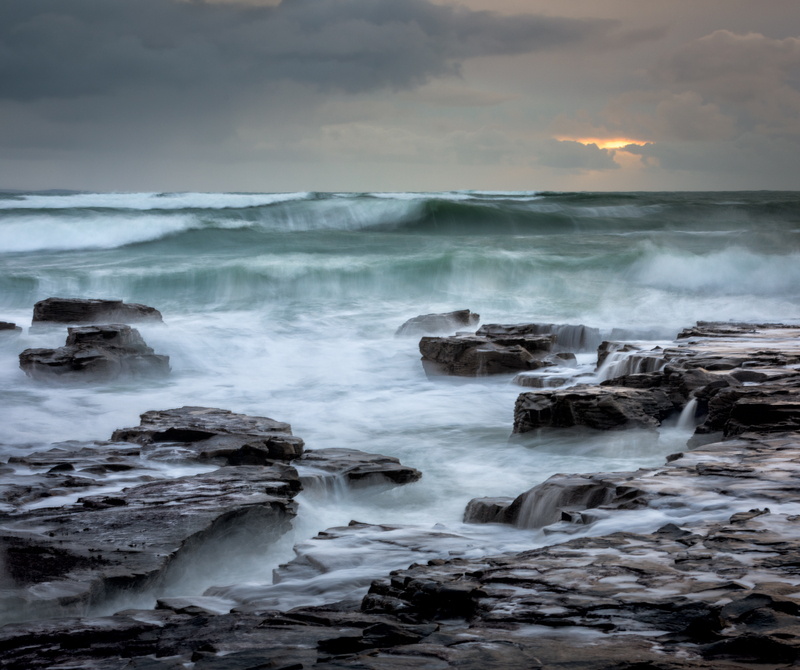 I want to talk about safety for photographers with an emphasis around seascape photography. There have been several fatalities here in Ireland over the last few years involving photographers and I know I have had a few hairy incidents myself. Safety is a subject we need to talk about more. Last weekend had me out and about at Howth Head on a very blustery morning. This is a location I have struggled to capture meaningfully on several occasions. A combination of high tides, east winds and sunrise were due, I thought I may just be in with a chance. Arriving early, myself and a friend walked in darkness along the cliff edge until we reached our descent point. We scrambled down a small, narrow, steep & overgrown mud path until we reached the bottom. To be fair, it was not overly exertive but the main problem getting down was not losing our balance in the wet mud. Once there, we were well sheltered from the large breaking waves you can see in the image below. The fabulous sunrise experienced back in Drogheda did not materialize 30 miles south in Dublin. This required a change in tactic from my usual close-up wide-angle perspective. Standing back, I used a telephoto lens to compress the scene taking me closer to the action. I came away confident I had a relatively decent shot in the bag. On the way back up, we both remarked that we were glad the wind was blowing from the direction of the coast. Otherwise, it could be dangerous coming from the opposite direction. A strong gust could easily have you across the cliff edge which has been known to happen in Howth. As a seascape photographer, the wind can be your best friend and your worst enemy. You need a bit to create wave action but too much can make conditions unworkable not to mention dangerous. Back home, the day passed as it usually would. Time spent playing with the kids, some household chores and I even had my parents around for tea. They had only left a short time when I got a text that sent shivers down my spine. 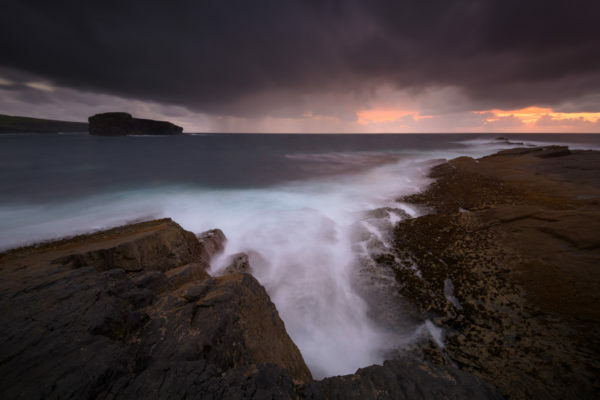 A photographer had been killed by a rogue wave in Co. Clare at a spot I had visited only a few months ago. Ann O’Connell had taken me to a spot called Dunlicky which had some fabulous cliff views. We stood shooting for a while until I became more adventurous (or stupid). I moved down the cliff to the water’s edge getting closer to the action as a rain shower blew in. Ann knew better, staying where she was, keeping a watchful eye. At no time did I feel safe, being aware how close to the edge I really was. I spent more time gauging how big the waves rolling in were than getting the image. I managed an unspectacular shot before the rain blew in. It left the rocks so wet, it became extremely difficult to walk back up. I regretted the move. Hearing the weekend news really brought it home to me. I had probably stood in the very same spot as that poor photographer. My thoughts and sympathies go out to their family and friends. What photograph could possibly be worth this? No photographer heads out to take risks with their life. It has reminded me that I have often pushed the safety limits a little too far. Thankfully, I have been lucky so far and will be re-considering how I approach certain situations. I have learnt a few bits in my time shooting that helps keep me a little safer. There is no denying that I & many others like shooting alone. However, a companion can be a huge help especially if it comes to raising the alarm should something go wrong. Warning – should your mate end up in the water, the very last thing you should do is attempt to go in after them. You cannot be any help if you also end up in difficulty. It’s a cold-blooded decision process but one of the first lessons you will be taught in water safety classes. Travelling in company has its advantages. Apart from the banter, you can share the driving if one becomes tired which is a safety measure of its own. When on location, you don’t necessarily need to stand shoulder to shoulder. Most locations are big enough that you can still do your own solitary thing whilst keeping each other in sight. I usually tell my wife exactly where I am going & what time I expect to be home. I call her if I find myself delayed. Should I ever become stranded somewhere without phone signal at least somebody knows where to start looking. It’s all too easy to get excited and rush into situ when you see an exciting new composition. If it is close to the water, I advise waiting and watching for about 5 minutes before venturing into position. In my experience, larger than average waves tend to roll in together. For example, it may appear relatively calm where you intend standing and then 4 or 5 larger waves could roll in one after the other. I have learnt to look at the rocks as an indicator of whether it is possible for waves to roll in. In dry weather, if they are anyway wet, it means waves have hit then recently so it may not be advisable to stand there. It takes a second to check whether the tides are moving in or out. I use tides.co.uk to check tidal conditions by location. My preference is for a receding tide when possible. There are some locations where water can move in behind you very quickly, cutting you off from the land. I personally rely far too much on my wide-angle lens. This requires getting very close to the foreground subject. Again, the image below demonstrates this is not always a necessity. 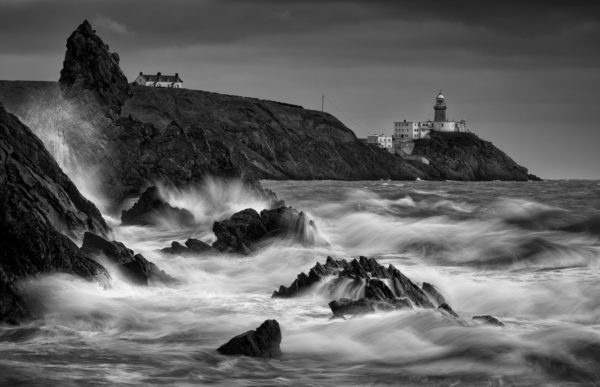 It was taken at a location in which the incoming tide made close access to the beautiful rock formations impossible. If it feels dodgy, it is. Try again in more favourable conditions. One of my favourite phrases is “The landscape is not going anywhere”. You can always revisit again and again if you keep yourself safe. I feel extremely bad writing this only a few days after this terrible accident. I am in no way implying that the recent tragedy was in anyway connected to bad decision making. Sometimes bad things just happen no matter how safe we try and be. My only hope is that somehow these small tips may help less experienced photographers to understand the dangers of our waters. They may even help somebody avoid an unwanted situation in the future. It is so unfortunate that it takes something of this nature to remind us that our personal safety needs to come first in the field.